If you love Andes Mints, you are going to go crazy for these melt-in-your-mouth Andes Mint cookies. They’re full of peppermint and rich chocolate flavor. While excellent for the holiday season, I plan on making and serving these all year long! Note: This recipe first appeared on the blog in 2017. I’ve made some revisions to the recipe! Several weeks ago, I had the honor of attending my younger cousin’s wedding, which was held at a beautiful and rustic winery. There were sweet touches everywhere. One of my favorite (and literally sweet) details was the “Candy Bar.” Framed with clear bags on both ends for guests to use, the long, thin table was covered in bowls and tiered dishes full of assorted green candies and scoops. Green gummies, Hershey’s kisses, Reece’s peanut butter cups, M&Ms, etc. It was a gorgeous display, and for some reason I went nuts when I saw the Andes Mints. I only took a few at first, but when I realized there were still a ton remaining toward the end of the evening… let’s just say I took a few more. The combination of chocolate and mint has never wowed me as much as, say, chocolate and peanut butter or malt (you should try my chocolate peanut butter cheesecake and my malted milk chocolate bourbon ice cream). But there’s something about the addicting smoothness of these mints that I love, and I wanted to capture that in a cookie. 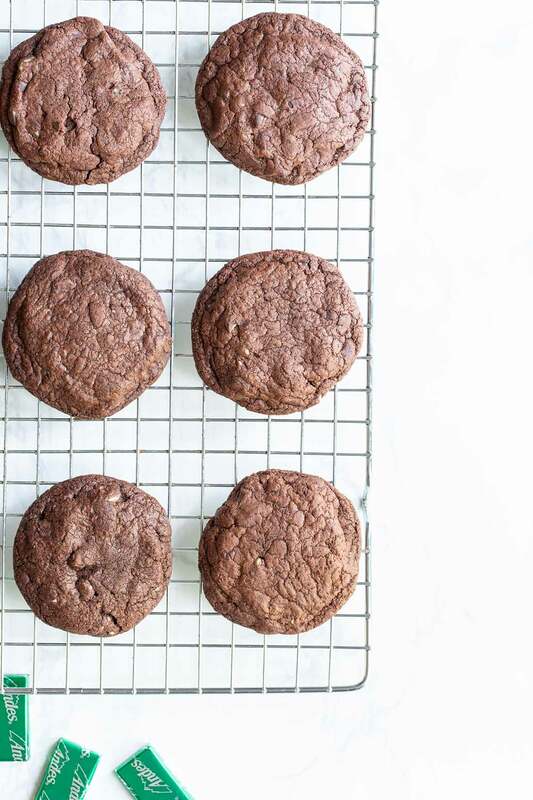 I think these chocolate mint cookies do the trick, but there’s a few things to keep in mind. These go from soft to crunchy very quickly, so you want to be mindful about not over-baking them. They’ll look slightly underdone when you remove the pan from the oven, but will firm up after 5 minutes. 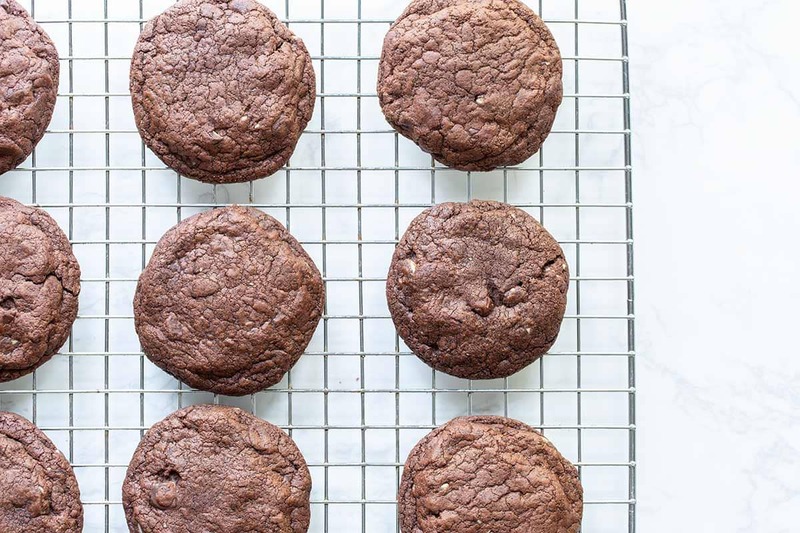 9 minutes was the sweet spot for me for soft, perfect cookies. At 12 minutes, they were slightly crunchy but not overly so. If you go for crunchy cookies, I highly recommend dipping them in milk. The cookies spread out a bit in the oven. Make sure to leave about 1 1/2 to 2 inches of space between them. My trick for chilling cookies is to scoop them close together, so that I can chill the entire batch on one sheet pan. After they’ve chilled, I portion them out onto a separate sheet pan, spread out appropriately for baking, while the remaining cookies rest in the refrigerator. This is efficient and helpful when I’m baking multiple batches of cookies. Love these Andes Mint cookies? You should also check out my Frosted Eggnog Cookies, Soft Gingerbread Cookies with Chocolate, and Snickerdoodles! I also love these adorable Ugly Sweater Cookies from Inspired by Charm. Love Andes Mints? 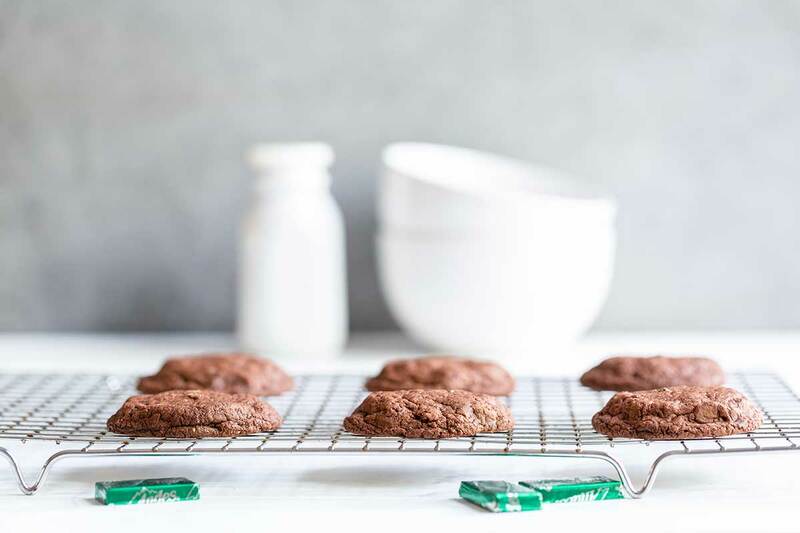 You are going to LOVE these melt-in-your-mouth Chocolate Andes Mint cookies, full of peppermint and rich chocolate flavor. Line 2 sheet pans with parchment paper (note: these cookies spread out quite a bit, so you’ll likely need to bake them in batches). In a medium-sized bowl, whisk together the flour, cocoa powder, baking powder and salt. In a stand mixer fitted with the paddle attachment (or using an electric mixer), cream the butter and sugar together on medium-high speed for several minutes until light and fluffy. Scrape down the bowl. Add the eggs, peppermint and vanilla extracts. Scrape down the bowl once again to ensure the ingredients are evenly combined. Add the dry mixture in several batches on low speed until evenly combined. Stir in the chopped mints. Use a 2-tablespoon scoop to portion out the dough onto the prepared baking sheet. Press the cookies down to about 1 inch thick, keeping the cookies about 2 inches apart (see notes). Chill the cookie dough for 15 minutes. Meanwhile, preheat the oven to 350 degrees F.
Bake the cookies for 9 to 12 minutes (9 for soft, 12 for slightly crunchy). Cool for 5 minutes, then transfer to a wire rack to finish cooling. My trick for chilling cookies is actually to scoop them relatively close together (but not touching), so that I can chill the entire batch on one sheet pan. After they’ve chilled, I portion them out onto a separate sheet pan spread out appropriately for baking while the remaining cookies stay in the refrigerator. 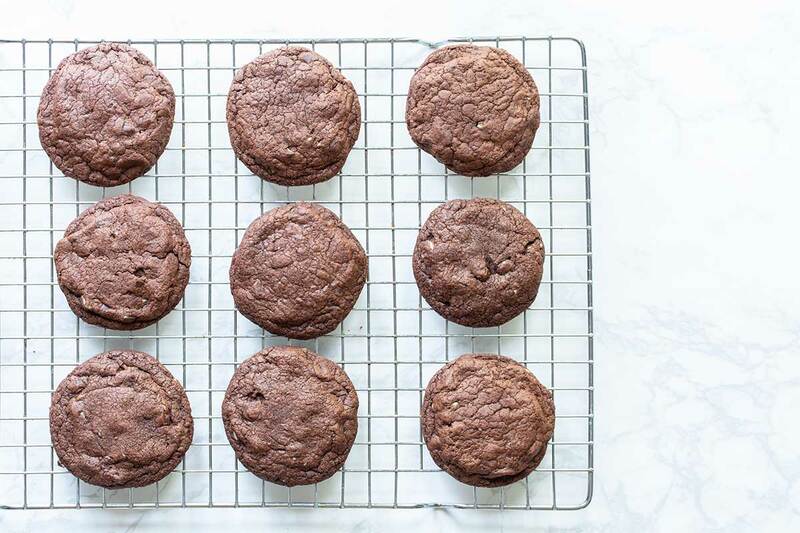 This allows all of the cookies to chill on one sheet pan, even if they require baking in several batches. I'm sure you can swap in other chocolate mints for the Andes Mints, but I can't promise identical results. Love all that rich chocolate in those cookies! These quickly disappeared in my house! These are my favorite holiday cookies! I think I just found what I am bringing to a cookie exchange! I thought the cookies tasted good, but probably won’t bother with them again. They’re actually pretty ordinary, and the unwrapping of 2 cups worth of candies is a put off. I noted that most of the comments were from folks who had not yet made them yet. Hi Marianne, thanks for taking the time to comment. I’m sorry you weren’t more wowed by them. If you ever feel like trying again, Andes Mints actually makes baking chips that you can use to avoid unwrapping the candy. I suppose I should note that as an option in the recipe. Part of the reason I like using the actual candy is because I think chopped candy melts more than chips. I usually add chopped chocolate to my chocolate chip cookies for this very reason. 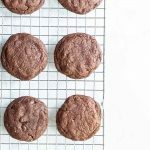 I’ve been thinking about these cookies ever since I first read the blog about them! I finally got all the ingredients and just finished making a batch. They are delicious! I cooked about half for the 9 minutes and then the others a little longer for the crunchy ones. I really enjoyed them. They were easy to make and turned out just like I thought they would.